Orthopedic boots protect broken bones and other injuries of the lower leg, ankle, or foot. They prevent more damage and help the area heal. Your doctor may have you use a boot for 1 to 6 weeks. How long you wear it depends on how serious your injury is. Orthopedic boots are removable, and most of them can be adjusted. Your health professional will show you how to put on, remove, and adjust your boot. 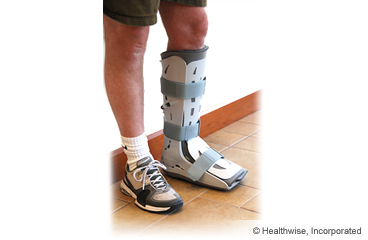 Ask your health professional to give you any instructions that may have come with your boot. Most orthopedic boots have straps. Some have built-in air cushions that hold the injured area in place. Some boots have settings that control how much your ankle can move. These boots are called controlled ankle movement (CAM) boots. Adjust or remove the boot only when your doctor says it's okay. If your boot has CAM settings, do not change those settings. Follow your doctor's instructions about how much weight you can put on your foot and when you can go back to your usual activities. If you were given crutches, use them as directed. Follow your health professional's instructions about adjusting the fit of the boot. If the toes on the leg with the boot were not injured, wiggle them every now and then. This helps move the blood and fluids in the injured leg. Prop up the injured leg on a pillow when you ice it or anytime you sit or lie down during the next 3 days. Try to keep it above the level of your heart. This will help reduce swelling. Be careful not to get the boot wet. Ask your doctor if you can take the boot off when you use ice. Put ice or cold packs on the leg for 10 to 20 minutes at a time. Put a thin cloth between the ice and your skin. Try to do this every 1 to 2 hours for the next 3 days (when you are awake) or until the swelling goes down. Keep up your muscle strength and tone as much as you can while protecting your injured leg. Your doctor may want you to tense and relax the muscles protected by the boot. Check with your doctor, physiotherapist, or occupational therapist for instructions. If your boot is not to be removed, try blowing cool air from a hair dryer or fan into the boot to help relieve itching. Never stick items under your boot to scratch the skin. Do not use oils or lotions near your boot. If the skin gets red or sore around the edge of the boot, you may pad the edges with a soft material, such as moleskin. Or you can use tape to cover the edges. If you're allowed to take your boot off, be sure your skin is dry before you put the boot back on. Be careful not to put the boot on too tightly. Check the skin under the boot every day. If you have diabetes, your doctor may ask you to check your skin several times per day. If you are not supposed to remove the boot, check the skin around the edges. Tell your doctor if you see redness or sores. Keep your boot dry. Moisture can collect under the boot and cause skin irritation and itching. If you have a wound or have had surgery, moisture under the boot can increase the risk of infection. If your doctor says to keep your boot on to shower, protect it so that it won't get wet. Put your leg inside a plastic trash bag and tape the top around your leg. If you can take the boot off when you shower, pat the area dry after you shower. Then put the boot back on. If your boot gets a little wet, you can dry it with a hair dryer. Use the cool air setting. You have severe or increasing pain. The skin under the boot is burning or stinging, or you have a warm or painful spot under the boot. You have numbness or tingling in the foot or toes that doesn't go away when you adjust the tightness of the boot. There is drainage or a bad smell coming from the boot. Your leg turns cold or changes colour. You have trouble moving your toes. Your leg, ankle, or foot pain returns or increases after your doctor tells you to stop using the boot. Enter L531 in the search box to learn more about "Orthopedic Boot: Care Instructions".